Hello everyone! I have been itching to get back, but I had promised myself I would take a break. I hope that everyone had a great holiday and I am wishing everyone a happy, healthy 2009. So what better way to start off the new year with a VERY messy project. When we start back at school next week, we will begin our discussions of the "wonderful" season of winter. I understand that many parts of the U.S. are really being hit hard by this season. Here, in the east, luckily, every time we get a big bout of precipitation it is rain. That's fine with me, but the kids are hoping for a good snow. 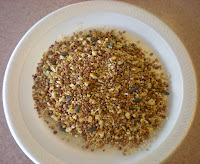 So one of the projects I will be doing with the children this month are bird feeders. The first bird feeder I have is one I made for many, many, many years. Unfortunately, peanut allergies started to get more prevalent and I have put this one on the back burner. As I was making it today, though, I experimented with a different type of "glue". 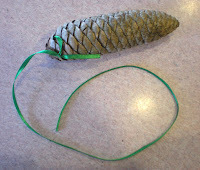 The first thing to do is to take a piece of ribbon or yarn and tie it around the top of the pine cone--not the pointy end. Next I usually give the children a plastic spoon and have them scoop out a big glop of peanut butter and spread it on the pine cone with the spoon. Some of them are going to love this step as their motto is "the messier the better." Others are not going to be quite so sure and will want some help. During this step peanut butter tends to get everywhere. I have a paper plate that I usually pour bird seed into. You can use any container that you are comfortable with, one with sides works good too, of course I always remember that AFTER I have bird seed everywhere. 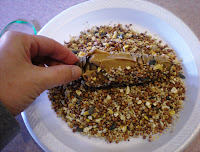 Allow the children to take their peanut butter covered pine cone and roll it in the bird seed. 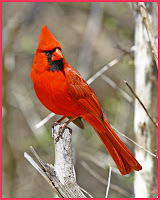 I also let them pick up the bird seed and and cover the pine cone that way. 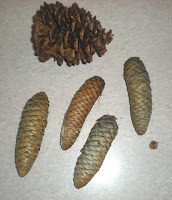 After the pine cone is covered with the seed it is time for them to be hung, any tree or bush will do. By spring your pine cone will be empty. As I said I tried a different "glue" this time too--honey. I wasn't sure if the honey would hold, or if it would run. 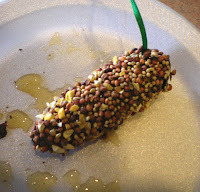 I took the pine cone, spread honey on and rolled it in the bird seed--IT WORKED! I was a bit stickier with honey than with peanut butter, just a different kind of mess. So if you have peanut allergies give the honey a try. I think it worked pretty good. The birds are gonna love you for all your effort! I found you thru Link Refferal. Neat Site and great crafts! Thanks you soo much I needed to find a way to make the pine cone feeders without using peanut butter and I found your site. It works great the girl scouts loved it!!! !